Be the big kahuna at your next BBQ with this island-inspired baby back ribs recipe. We'll be using an easy marinade that features just five ingredients. But make no mistake -- it'll have your baby back ribs bursting with the exotic flavors of the tropics! When I think of tropical foods, pictures of exotic fruits often come to mind. And that is the basis of our recipe - tropical fruit flavors. However, we won't be using actual fruit to get our flavor profile. The key ingredient in this recipe is vodka: Svedka Colada Vodka, which is a Swedish liquor infused with coconut-pineapple flavors with a hint of mango. If you like heat, you can replace black pepper with red pepper flakes or sliced jalapenos. Prep your ribs by removing the thin membrane (the fell) on the underside of the ribs. Rinse ribs and pat dry. To make marinade, combine all the ingredients in a bowl and stir until sugar is dissolved. 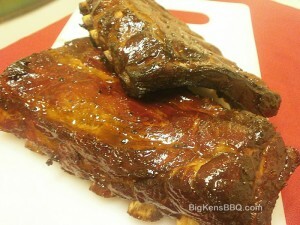 Combine ribs and marinade in a large freezer bag or non-reactive container. Refrigerate for at least 4 hours. When ribs are done marinating, remove them from the marinade but do NOT discard the marinade -- set it aside. Next, set-up your grill for low indirect heat (225°F-240°F). Smoke ribs using the 2-2-1 method for baby back ribs. While your ribs are smoking, boil marinade until it is reduced to less than half. Be careful not to let it burn. (Note: If you want to further thicken the sauce, add a little corn starch mixed with a little water. You could also use honey). For the final 30 minutes of smoking the ribs, baste with the marinade/sauce. That's it!